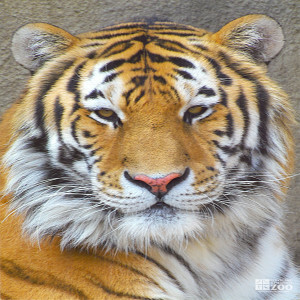 The Amur Tiger, also called the Siberian Tiger has a "Head and body length of 9 to 12 feet; a tail length of 3 to 4 feet; and a weight of which males are 400 to 675 pounds and females are 220 to 370 pounds. Tigers are the only striped cat. The coat varies from dark orange to reddish ochre with the belly, neck, throat, and insides of the limbs being a creamy white. The vertical stripes may be black or dark brown. Amur (Siberian) tigers are the lightest -- as well as being the largest -- of the tigers, and have longer coats than do their southern-ranging relatives. The range of the Amur Tiger is the Amur River Valley in the Soviet Far East. The habitat of the Amur Tiger is deciduous and evergreen forests. Gestation usually takes 104 to 106 days usually; possible 93 to 111 days. Litter size is 2-3 usual, 1 to 6 possible. In the Amur Tiger, females’ territories may either be exclusive or overlapping, with range size being dependent on the density of the prey species. Males’ ranges are larger and usually overlap the ranges of several females. They are active chiefly at night. They can leap distances of 16 to 20 feet, and 6 feet high. Tigers are not unsocial, despite the fact that they usually hunt alone and, in fact, often come together to share a kill. Neighbors often have amicable relationships. Females spend a large portion of their lives accompanied by cubs. Tigers are tolerant of a wide range of climates and habitats, only requiring adequate cover, water, and prey. They depend primarily on sight and hearing for hunting, and kill by strangulation or a bite to the back of the neck. They will bury the remains of a carcass and may return to feed from it for several days. Tigers can eat as much as 88 lbs. of meat at one time. Although they are excellent hunters, only 10% of all attempts result in a kill. They lead a nomadic life, travelling long distances in the winter in search of food. They can endure intense frost, but when travelling in deep snow they tire rapidly, and must rest often. Vocalizations include woofs, roars, rasping grunts, purring, soft grunts or puffing sounds called “prusten”. Amur Tigers may mate at any time during the year, but most frequently from November to April. Births are usually spaced by 2 to 2½ years, although occasionally by as much as 3 or 4 years. If the entire litter is lost they may produce another litter in 5 months. The young nurse until they are about 6 months old, and males grow more rapidly than females. The young usually leave their natal range when they are 2 years old and their mother has another litter. Some female cubs never leave, eventually forcing the mother out of her own range. Females enter estrus every 3 to 9 weeks with receptivity lasting 3 to 6 days. The cubs open their eyes at 6 to 14 days and begin to travel with the mother at 5 or 6 months. The mother teaches them to hunt, and they are usually capable hunters by the end of their first year. Sexual maturity is reached by females at 3 to 4 years, and by males at 4 to 5 years. About half of all cubs die in the first 2 years of life. Red deer, wild pigs, serow. In summer they eat grass, cedar nuts, fruits and berries. Feline diet, once a week horse meat/rabbit/chicken.